The Art Library in Eckernförde was founded in 1981. Borrowing original works of contemporary art for a small fee provides customers with the opportunity to deal with art at home in a relaxed way. During this period, the picture is used not only by the borrower himself but also by family members and visitors, so to speak, and usually reaches a much larger audience than the borrowed book. In a museum or a gallery we can at best ‘glance at’ pictures. What would we think of someone who ‘throws a glance’ at 50 books per hour in a library? Even a work of fine art is only accessible to the viewer over a longer period of time. Art libraries encourage experiments and allow the periodic change of originals, which would otherwise be too expensive. 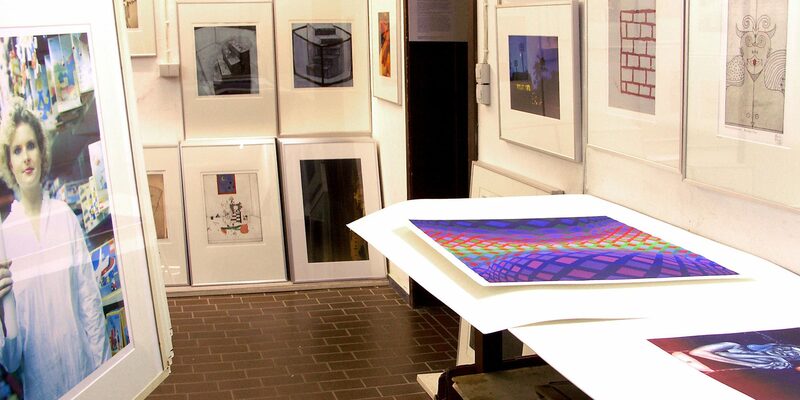 The Art Library has a stock of around 800 originals, most of them etchings and monotypes made in the intaglio printshop. These include works by artists from the region, such as Maria Reese, Carl Lambertz and Peter Nagel. There are also international artists such as Walter Stöhrer, Marlene Dumas, Tuomo Manninen, Carsten Höller, Leonhard Lapin, Sigurdur Gudmundsson and others. Norbert Weber is chairman of the State of Schleswig-Holstein’s Artothekenverband representing 12 art lending libraries in the northernmost federal state.